Apart from the gear, a good quality tackle box with lots of organized storage is a must-have for any fisherman. 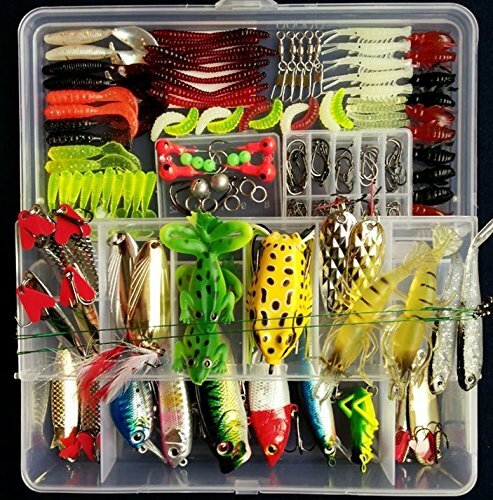 Depending on your preference and the application that you’ll be using the box for, some of the qualities to look out for in a tackle box include flexibility, versatility, durability, and ease of use. It’s also important to look out for a box that is well-designed with enough compartments to keep everything well-organized and safe. Speaking of safety, security features like 3-phase latches, multiple lids, and hinges, will give you peace of mind knowing that your gear is secure even in the midst of choppy water that might cause your box to move around or fall off. You’ll also want a box that meets your budget expectations, while still maintaining all the features you need for your unique application. 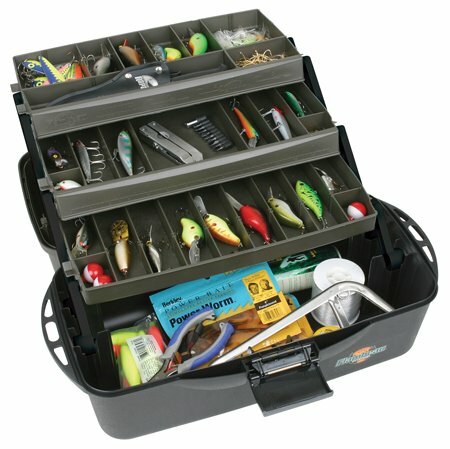 Below we’ve featured a list of unique tackle boxes that meet different needs, from compact to large, budget friendly to great all-rounders. It’s proof that there’s a tackle box for every type of angler and one to use for every application. 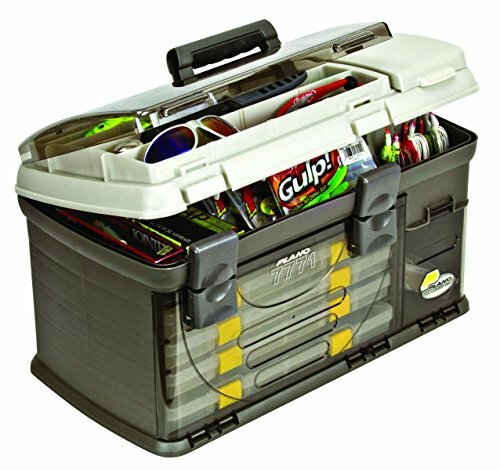 This box has a wide range of storage components, including a 4-layer storage system that incorporates spinnerbait bottom racks and specialized storage under the top lid. It’s a versatile box that gives you the flexibility to carry as much gear as you need for your trip and extras just in case. From hooks to lures, line, weights, sinkers, reels, etc. With this box, you’ll always have the right tools for the job. The components of the box are made from high-quality materials, and each box comes pre-tested for durability, so you know it's going to last you for more than one season. It’s also suitable for both novice and experienced anglers, and can easily adapt to different applications. This mega storage box comes with spacious compartments for bulk storage, including 4 removable trays, 3 bait racks and more. It also features an over molded handle for easy transport as well as a DuraView cover. It’s large enough to handle multiple big sized lures and is ideal for anyone who prefers to bring ALL their gear on their fishing trip. You can use the top compartment to store your most used items, while the bottom layers are ideal for storing large items and extra gear that you might be bringing ‘just in case'. And it’s made from high-quality materials, which means that it’s long lasting and durable. This spacious box from Flambeau comes with unique features like tip-guard tray support, weather–proof and worm-proof construction, as well as water resistant design. It’s got 3 large removable trays with 37 compartments combined, all of which create multiple storage capabilities and give you the flexibility to customize the storage to your preferences and needs. The bottom tray specifically has plenty of room to fit lots of tackle and as many accessories as you like, and there is plenty of storage for small parts, which you can rearrange to suit your preferences. It has also been conveniently fitted with two lids on the top tray, as well as a Drawtite latch to keep the box securely closed and prevent items from moving around inside. 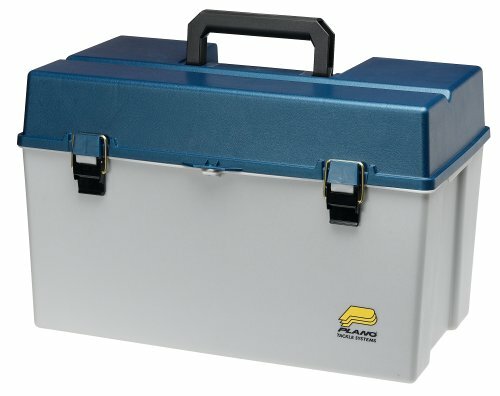 This box even features a reinforced interior to easily handle large amounts of heavy gear, which makes it an ideal companion for lengthy fishing trips. This is a simple and uncomplicated box that mainly features a hook disgorger, swivels, tin split shot and 6’ stringer. It also comes with all the gear you’ll need as a beginner angler, including bobbers, hooks, spinner, etc. 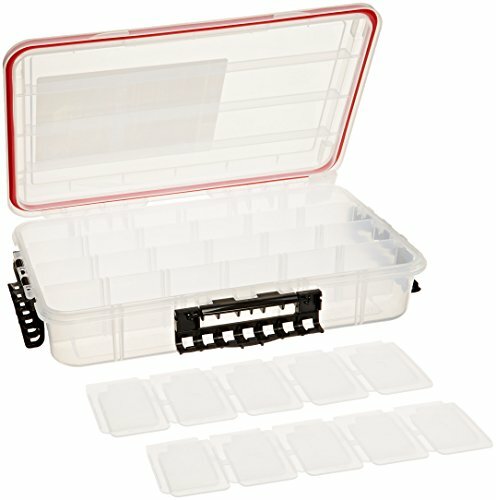 Storage-wise, it’s a relatively tiny box, but conveniently lightweight and easy to carry around, and it has a reasonable amount of storage capacity including a removable tray and an assortment of hooks and multi-colored floats to keep gear organized. 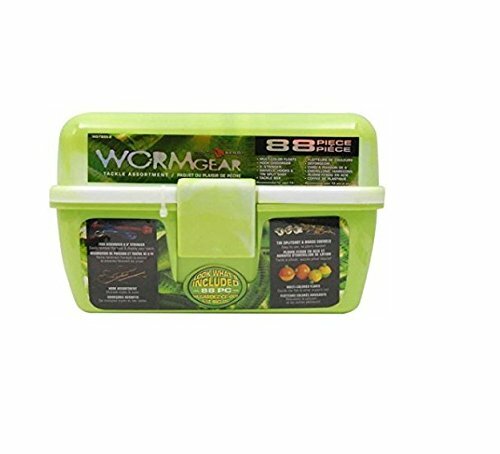 This huge box is constructed from high-impact plastic and features 100% wormproof and waterproof design with removable racks, and has plenty of storage that can hold up to 40 long baits. The box also features specially designed slots to keep lures, as well as dividers to help keep the rest of your gear organized and convenient to access. 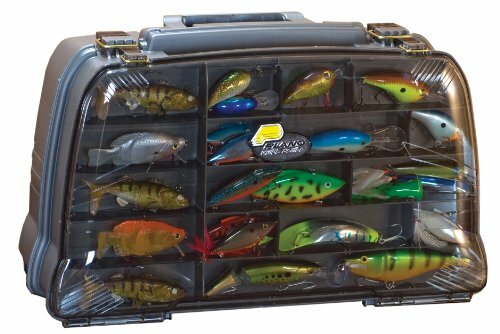 This colorful, compact and well-priced box is jam-packed with lures, baits, hooks and the perfect internal storage setup to get beginner anglers off the ground. Although small, you can pack a lot of stuff into this box, and seasoned anglers can use it for short trips, while newbies will enjoy the convenience it offers with the pre-packaged gear. 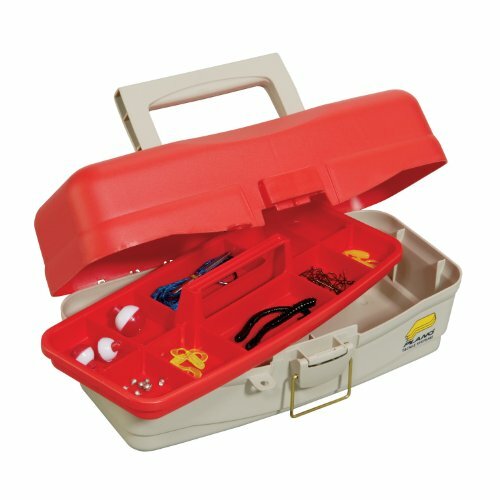 Speaking of gear, this box comes with two fishing tackle sets, which include tons of fishing lures, a multi-tool, mini flashlight and a free tackle box. It’s made from a combination of metal and plastic materials and comes with just the right gear for freshwater fishing. 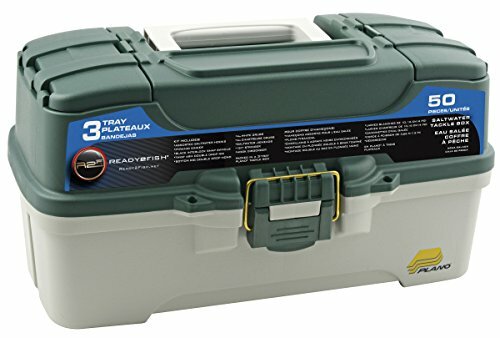 Keep your gear dry and safe with this convenient tackle box from Frabill Plano. It features a secure lid that snaps in place pretty nicely to prevent stuff from falling out, which is great to know when your kayak is tossing stuff around or tipping over due to turbulent waters. Other security features include the Dri-Loc O-ring seal and 3 tight-sealing Cam action latches. The box also features 4-15 adjustable compartments that are large enough to store big items like crank baits, and it’s available as a pack of 2 or 3 depending on your specific preferences. It also features permanent dividers and inserts so you can customize the storage to suit your needs, and its bottomless design is perfect for storing everything you need for your fishing trip and more besides; including weights, lures, bait, swivels, line, and leaders, etc. For the ultimate in saltwater gear and storage capacity, look no further than this 50-piece tackle box with 3 separate trays that contain an assortment of the items you’ll need for your trip. This tackle box includes hooks, swivels, different types of sinkers and rigs, as well as a hook disgorger, a stringer and jig heads. It’s an ideal box for a beginner angler or anyone who wants to enjoy a stress-free saltwater fishing trip. The box is exceptionally well-organized with clearly delineated compartments and an ergonomic design that makes for convenient use. 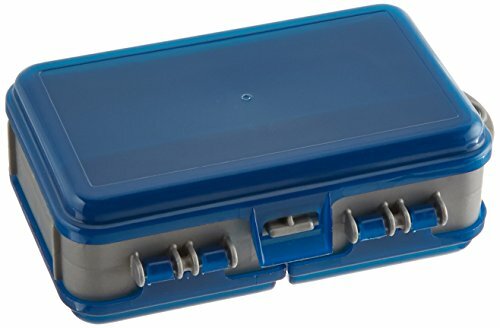 Keep everything organized in this neat and compact tackle box from Plano. It comes with two removable dividers which in turn feature up to 6 compartments and double-sided capacity. It’s the ideal box to store small baits and is available as a pack of 2 or 3 depending on your preferences and what you’ll be using it for. It also features clip lids to keep everything safe and secure, while the waterproof design keeps gear dry, and the compartment dividers are great for keeping stuff organized. The safety features could use some improvement, as the flimsy clip lids don’t hold up for very long. You’d do well to seal it with a rubber band on top just to be sure. This awesome beginner’s box from Plano comes with a great starter kit, including an assortment of tackle, hooks, stringer, jigs, and bobbers. It’s compact, lightweight and easy to carry around and travel with, and yet it has enough storage and compartments to keep a variety of items secure and organized. It’s also ergonomically designed for ease of use by kids and has a practical lid that’s easy to open and shut. Whether you’re fishing out in the ocean, or enjoying a leisurely summer trip at your favorite lake, having a good quality tackle box by your side will make it that much more convenient and memorable. As you can see, there are a variety of tackle boxes to suit different applications and types of fishermen, each with specific features that can make or break your trip. Choose wisely and happy fishing!